These schools are for those of you who are just getting into the sport of fly fishing or those who have been self-taught and would like to learn more. It is a weekend of fun for men, women and children wanting to learn the art of Fly Fishing. In these classes we teach you the basics about the world of fly fishing. We start by talking about rods, reels, lines, leaders, gear and gadgets you may need. We then spend about 4 hours on the water learning a variety of fly casting techniques. We will teach you the basic fishing knots you will need to know. We will then talk to you about Streamers, Dries, Nymphs, and Wet Flies. Then, off to the River for demonstrations on Streamer Fishing, Dry Fly Fishing, Nymph Fishing and fishing Wet Flies. We also teach basics about reading water and basic entomology (bug info). We end the day in the evening on the river with a nice dinner with all the fixings. The last day of the school is all on the water. Basically, it’s a float trip mixed in with some wading; you’ll learn a variety of techniques we use while fly fishing and catch some trout while your at it. Things you need to bring to these classes are: fishing licenses, waders or wading sandals, rain gear and sunglasses (preferably polarized). We supply all rods, reels and lines for the classes, but please feel free to bring your own if you prefer. These are 2-day classes, and not just on weekends, so let us cater one for you. With being a small business I can only cater to small groups of no more than 4 people. Private classes are also available for families wanting to do this together. These schools run anytime from May through August; prices include lunch and equipment. Prices for this class are $500 per person. Below are recommendations for lodging in the local area. If you’re coming up to fish on your own and need a tune up before heading out, or if you’re having problems with your cast, these lessons will help. 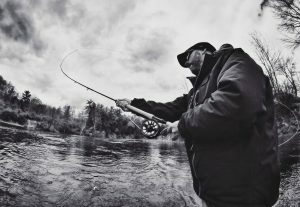 Whether you’re a beginner or an experienced fly caster, we can help improve your casting technique and fly fishing skill. These lessons are conducted on the Manistee River so that we are on moving water, this enables us to learn under realistic river conditions. We do this in order to assess skills, develop effective techniques and improve individual casting performance. If you are interested, these lessons are $50 an hour. This school focuses on Spey casting and swinging flies with two-handed rods. We will teach you essential casts and techniques you will need to know for fishing either side of the river (“river right” and “river left”). 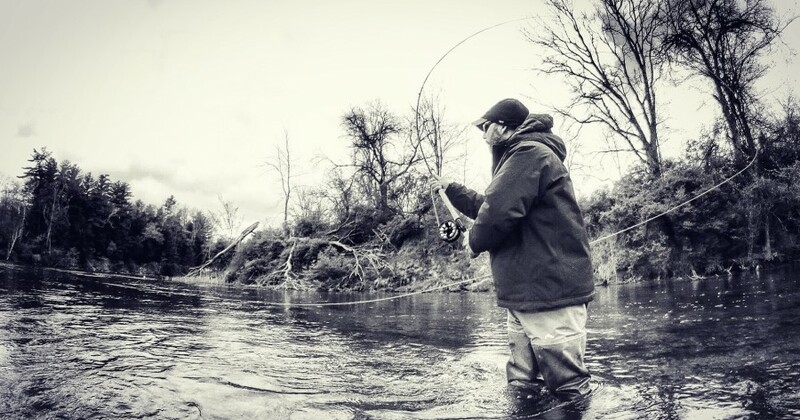 There are two basic casting techniques for each side of the river: Snap-T and Single Spey for fishing “river right” and Double Spey and Snake Roll for fishing “river left.” Also, we teach you how to fish a fly with floating lines and sink tips. This is one of the most challenging and most gratifying ways of pursuing Steelhead on a fly, and as a fly angler, it is something you need to try. These are one-day classes, and are $300 per person. Lunch and equipment are included. Below are recommendations for lodging in the local area. For those of you who have been to an Introductory Fly Fishing School and would like to advance more, we have something for you. What we are offering is a 2 day advanced trout school, starting with some advanced cast such as: single hand spey cast for ease of change in direction, no more multiple roll or false cast to get your fly to your target. The two cast we will teach are the snake roll and snap t, one cast for fishing river right and one for fishing river left. The one nice thing about these spey cast is that it enables you to cast further with minimal back cast room. The other cast will be a steeple, not necessarily a long distance cast but one that gets used wading and in a boat, whether it be to clear a tree behind you or your buddy in the back of a drift boat. Another will be a puddle cast, which is adding slack to your line in mid air to present your fly to a fish, whether it be up stream or down stream. Reach mends and proper mending techniques are next on the list to help you achieve a natural drift. Once all the cast and mends are learned we will step into advanced fishing techniques with streamers, nymphs, dry flies and wet flies. We will get into a little tricks of the trade. Then we will move onto helping you read water (what to look for), which will help you learn where trout live and why they live there. This school is based on tuning you up and teaching you new techniques to help you when your out there on your own, the more you learn the easier it gets, the more fun you will have. Price is $500 per person. Lunch and equipment are included. Below are recommendations for lodging in the local area. If you are interested in any of the Michigan fly fishing schools please click here to contact us.